Declassified U2 spy plane images showing desert kites in Jordan—stone structures used to trap animals between 5,000 and 8,000 years ago. 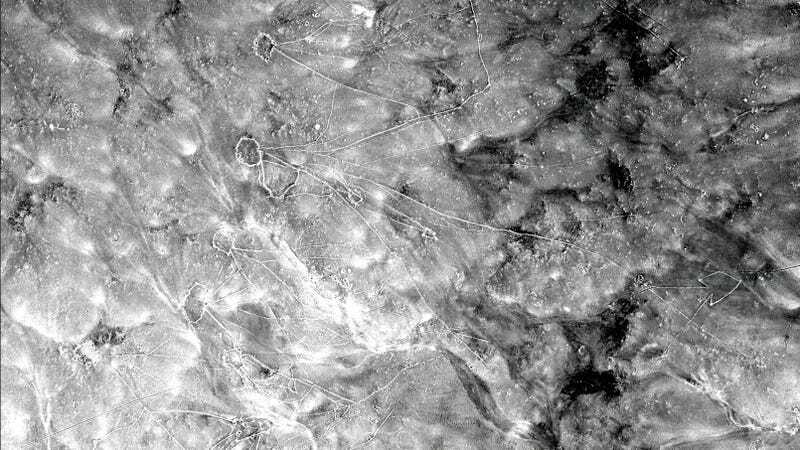 New research published last month in the science journal Advances in Archaeological Practice describes the first archaeological use of declassified U2 spy plane images. The authors of the new paper, Emily Hammer of the University of Pennsylvania and Jason Ur of Harvard University, used the historical images to identify prehistoric hunting traps, ancient irrigation canals, and old marsh villages. Flying 70,000 feet above the ground, U2 spy planes captured thousands of images during the 1950s and 1960s. The photographs taken during this mission, code-named CHESS, were finally declassified by the United States in 1997, but the data wasn’t immediately indexed or scanned. To make the data useable, however, Hammer and Ur had to systematically build an index of the U2 imagery. The researchers selected film rolls from the National Archives’ storage center in Kansas, which were then transported to the aerial film section in Maryland. The selected film rolls included thousands of high- and low-resolution frames—literally hundreds of feet of film—which were unspooled and analyzed over a light table. Hammer and Ur photographed the negatives using a 100-millimeter macro lens. The photos were then stitched together, adjusted, and geo-referenced using software. The researchers also analyzed nearly 3,000-year-old canal systems built by the ancient Assyrians in what is now northern Iraq. This irrigation system “fed the royal capitals, made agricultural surplus production possible, and provided water to villages,” noted Hammer in the statement. The index also also used to do some more recent history, namely a survey of Marsh Arab communities in southern Iraq dating back to the 1950s and 1960s. These communities disappeared after hydroelectric dams were built in Turkey, Syria, and Iraq. The new data allowed the researchers to visualize the layout, size, and environmental position of these historical places. This work will now be put online and made available to other researchers, who can go through the frames and perform their own landscape and aerial archaeology. Which is very cool, especially given how much work was required to create this incredible—and highly useable—historical record. Correction: A previous version of this article incorrectly described the altitude of the U2 spy plane as 17,000 feet, when it was actually 70,000 feet. We regret the error.